The TS-A line includes a new highly rigid Multilayer Mica Matrix Cone structure for a wider dispersion of sound with deeper bass, and a new tweeter designed to deliver an improved range of mid to high frequencies and produce optimized sound at higher volumes. The technology improvements offer better performance, enhanced sound quality and the ability to play a larger variety of popular music with heavy bass including hip hop, dubstep, and alternative rock. Absolute fidelity to musical sources takes form from speakers that reproduce the ambience in which sounds originate. Stage size, musicians’ movement, aural reflection and other distinctive details all bring these sounds to life. 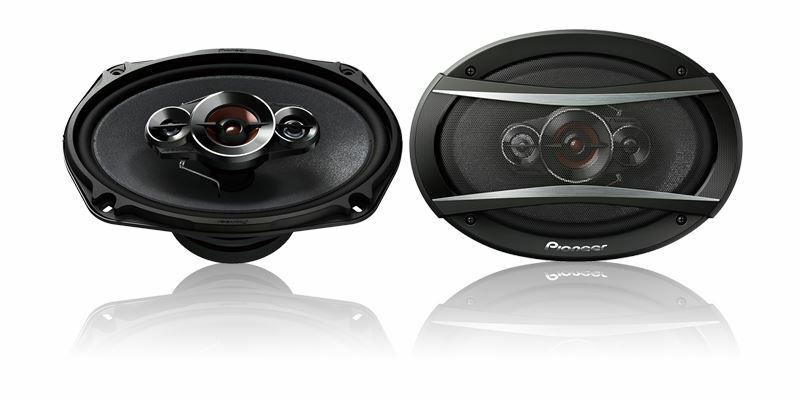 Pioneer A-Series speakers are available in 2-way component packages or coaxial designs in multiple sizes that fit most vehicles. Various materials were carefully combined to develop a diaphragm of extra lightness and rigidity to reproduce sound clearly with outstanding responsiveness sensitivity and a suitable degree of internal loss. The new A-Series speakers feature a multilayer mica matrix cone where a surface containing mica properly maintains the cone’s superior rigidity and internal loss while another layer makes excellent use of light, water-resistant material. The TS-A6986R speaker design enables mid and high frequencies to be projected in a uniform and wide dispersion pattern, resulting in a smooth on- and off-axis response. The hard plastic in the diaphragm is optimized to balance lightness and rigidity, so that it achieves outstanding sound propagation with high sensitivity, speed and responsiveness.The large magnet greatly enhances drivability of the diaphragm and ensures that sound is reproduced with impressive power.